Every day, we see brides-to-be who are on the verge of tears, because they’ve spent hours on their own trying to figure out what printing technique to use in printing their wedding invitations. Is this you, too? If it is, we’re here to help! Dreaming up your wedding invitation should be fun, not something to cry over. 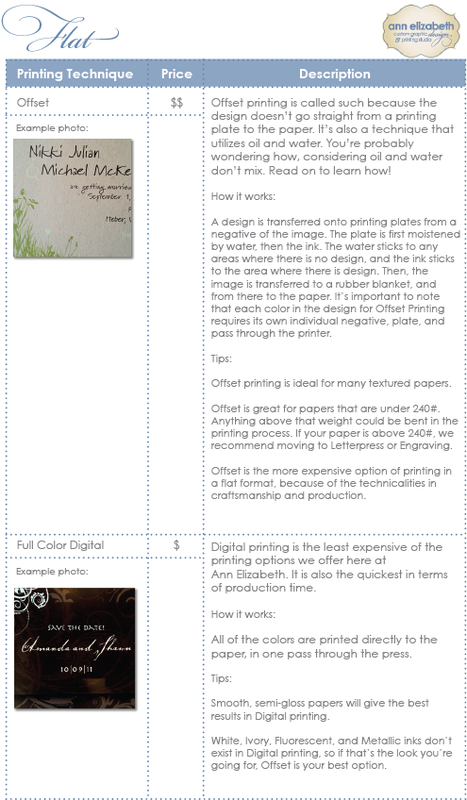 With all the different ways to get a beautiful design onto paper, this can get confusing pretty quick, so that’s why we’ve written up a guide for the different techniques available to you through Ann Elizabeth, and hopefully dry some tears (or avoid them all-together!) in the process. Many people see an image or text that looks “3D” and call it “Embossing.” They don’t know that there are many ways to achieve that effect– some more budget-friendly than others. See the “Raised” table to see the difference between these options and how the look is achieved. Most of our clients think that 8.5×11 is pretty much the only size of paper. Little do they know that most bulk printing is done on much larger sheets of paper that are then cut to size. Many brides-to-be get anxiety over choosing ink colors, but luckily we have a solution! Thanks to the Pantone Matching System, you can flip through the Pantone Swatch Book, point to the exact color you’ve envisioned, and know that your ink will look just like what’s in the book. Say “goodbye” to sweating over whether or not your green invitation will come out looking more like puke or the gorgeous tone of olive you planned on. 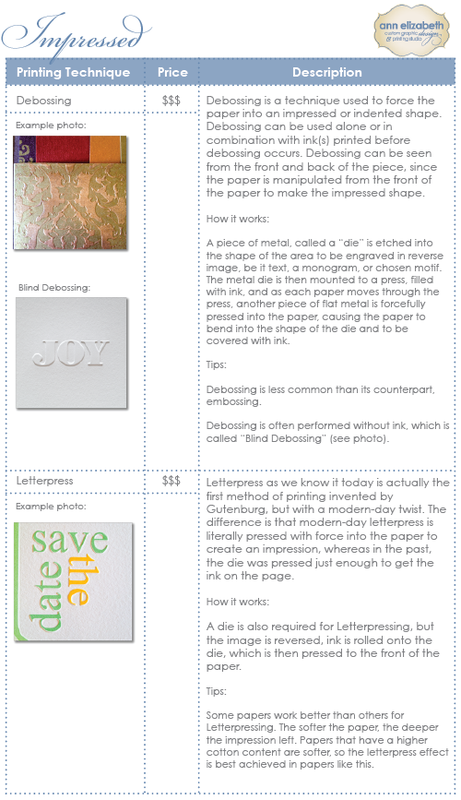 The tables below explain the basics of common printing techniques for wedding invitations. You’ll find 3 sections of the table, organized by the “look” you’re going for in your invitations: Raised, Impressed, or Flat. So there you have it! 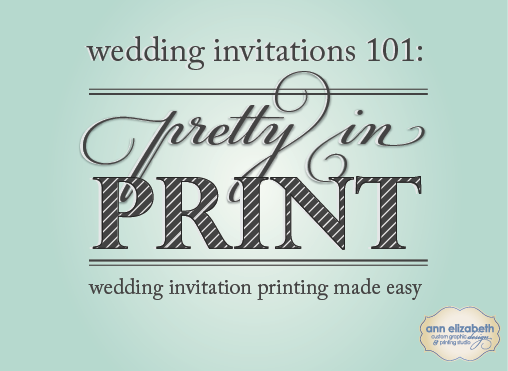 We hope you enjoyed this post, and that we have shown your “wedding printing woes” the door.